Michaela and Kenny. Contemporary Knights. Photo Lauren Stone. “Contemporary Knights”, the latest show to be hosted at the Freestanding Room, combines serious subject matter with smart humor in the form of two one-act plays that build on each other as they explore the interaction between mental illness and relationships. Written and directed by Lauren Stone, both pieces feature complex female leads that struggle with conditions granting them both strength and instability as they engage with men who have an interest in them. The males serve as vehicles to address the perceptions of mental illness from an outsider point of view, the romanticising of crippling illness and the often confrontational dynamic between the sexes. “Ledges”, the first play, is centered on the evolving relationship between Marie, a woman being treated for bi-polar disorder, and Paul, the guy who convinces her to rethink her plans of jumping out the rooftop and, instead, share a cup of coffee with him. From a one-night stand to parenthood, their relationship moves with both speed and volatility. 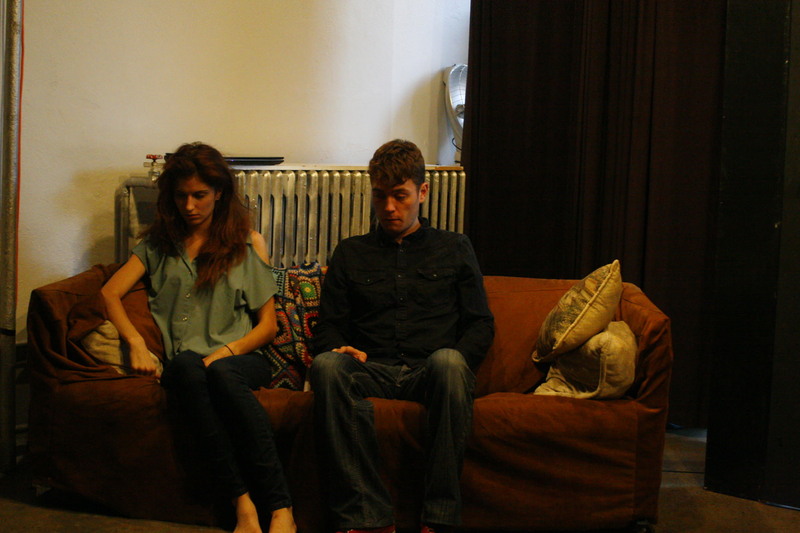 The main strength of this piece is the on-screen chemistry between the actors Michaela Di Cesare and Kenny Streule. Their interactions feel genuinely tense during the moments of conflict, drawing the audience closer to the nature of their conflict. On the other hand, their cuddly moments are marked by a tangible cheesiness that makes the public want to look the other way (this, of course, meant as a compliment to their acting skills). The second play involves a bigger cast, consisting of two girls and two guys. “Black Flats” tells the story of Kiya, a young woman with OCD who has developed agoraphobia. Her good friend has been supportive but also feels that Kiya needs to start overcoming the assault that triggered this episode. In this story, the men interpret her condition as quirkiness and as an excuse to dodge their advances. One of the weaknesses of this second piece is they way in which Kiya displays her OCD. Her rituals and obsessions can feel like a drag on the stage. They could also be displayed in a way that is more conducive to providing insight about her character. Also, by expanding the cast to four characters, the personalities and motives of the roles feels a little diluted. On the other hand, the dialogue is precise, funny and even allows for the sprouting of curious references like the Mamas and the Papas, fairy tales and even characters from the mythical court of King Arthur. Both pieces are highly enjoyable and provide an emotional roller-coaster, while at the same time offering chance for reflection about highly relatable topics. Contemporary Knights is showing at the Freestanding Room (3rd floor at 4324 St Laurent) from August 7 to 9 at 8 p.m. Late matinee on August 10 at 5 pm. $10.Read our review here. Perfectly Polished and Fierce. Glengarry Glen Ross Review.